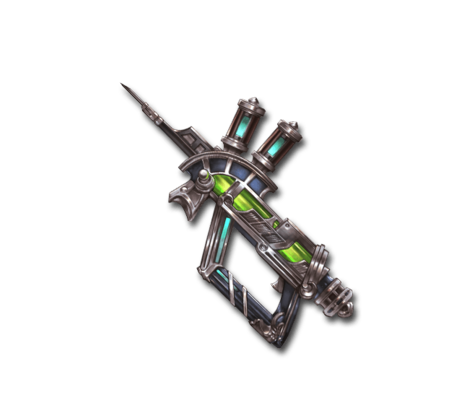 Once used by a legendary physician who could ward off even the Grim Reaper, this syringe gun can act as either the greatest elixir or the deadliest poison depending on the amount of medicine injected. Clear-Cut Diagnosis Massive550% elemental damage elemental damage to a foe. Duration: 3 turns, and RevitalizeRecover HP each turn. Boost to charge bar if HP is full. Doctor's Essence This is the essence of greatness. Gain its power by using emblems. Doctor's Humanity When main weapon: Boost to Just the Cure's specs Healing Cap increased by 500. / Immunity to Zombie effect. Duration: 2 turns upon using healing skills. foes is not associated with which random debuff is inflicted (it always happens). The bonus charge attack damage is 20% of the main charge attack damage, so it is affected by Charge Attack DMG Cap Boosted effects. Clear-Cut Diagnosis always attempts to inflict a random debuff. Local status effect lasts 1.5 turns is ~50%Estimate based on sample size of 38.. Otherwise, it lasts only 0.5 turns. Local status effect always lasts until the next turn if the foe receives no further damage within the attack phase. ChanceEstimates based on sample size of 400. Blue Potions will apply the buffs to all allies, even if they were already at full HP. The buff only applies for healing skills cast by the Main Character.